This is a photo of crack I got earlier this week to feed my addiction a skein of the silk yarn I have been dying feverishly all week with thoughts of my Mother’s birthday present (a silk shawl) in mind. I can’t say enough about this yarn. If it was a man, it would have been love at first sight. It is so incredibly soft. I want to roll around in it. 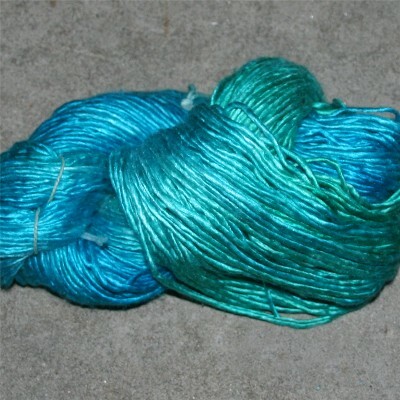 I love new yarns, different yarns, soft yarns, but this goes beyond the normal attraction. I’m thinkinging about knitting socks to wear when I’m lounging aroud the house. I must leave you now to go sit and fondle my beloved some more. Oh, it’s just lovely. I love the lustre of silk. Please, please don’t stop — I can’t start another project and I have to live vicariously through you. Seriously though – it’s gorgeous, keep up the excellent work!